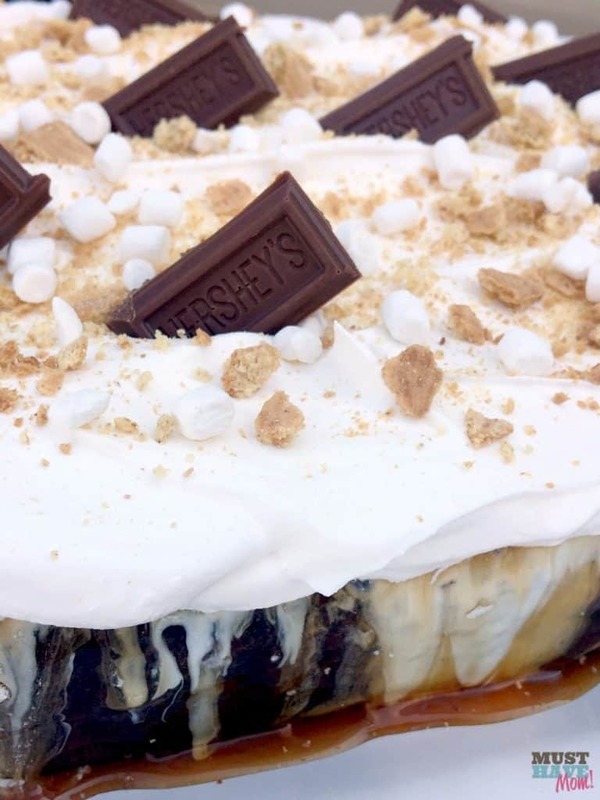 This quick and easy s’mores cake recipe is out of this world. I made it up a bit on the fly for my son’s camping themed party and it turned out amazing! 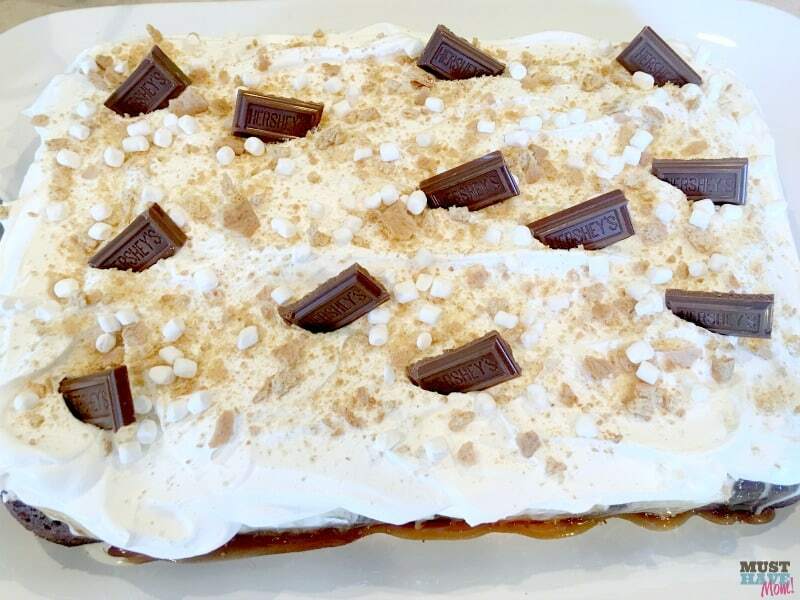 Everyone at the party was raving about it so I knew I had to share the recipe here so everyone could take part in the amazing s’mores cake yumminess. You’ve been warned folks, this recipe is amazing and definitely not low fat! 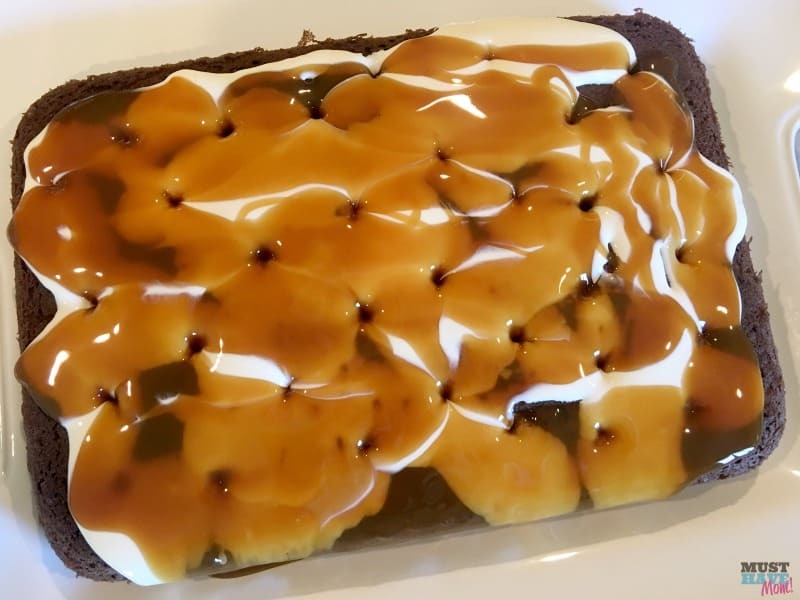 The recipe starts out with a chocolate cake base and then we add layers of ooey, gooey marshmallow, caramel and top it off with Cool Whip and throw on the s’mores toppings. Once the cake is baked it is just a matter of assembling the cake. It takes no time at all and will knock your socks off! Begin by baking a 9×13″ chocolate cake mix according to the box instructions. Allow it to cool for ten minutes and then flip it out onto a serving tray. Using the opposite end of a wooden spoon poke holes into the cake all over. 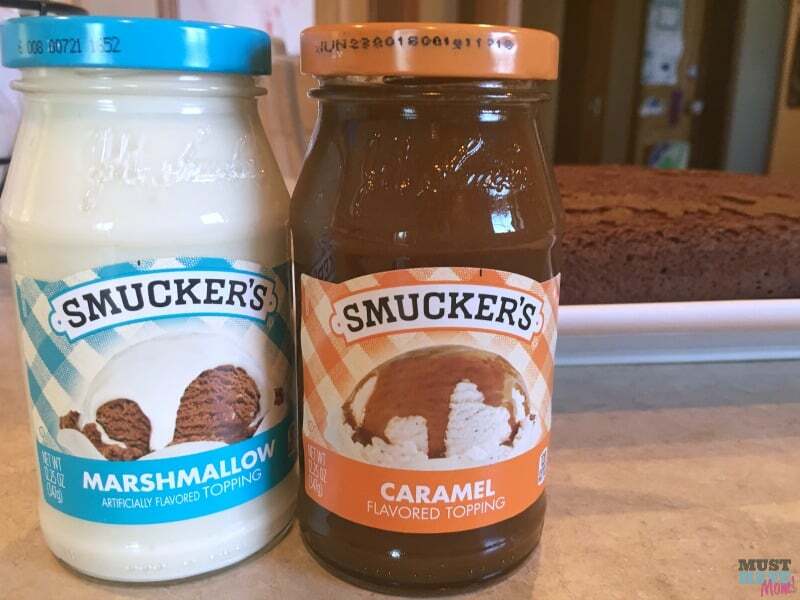 Next, you’ll need a jar of marshmallow topping and caramel topping. While the cake is still warm, but not hot, pour the jar of marshmallow topping over the top. Next, pour the jar of caramel over the top of that. The toppings will melt and fill the holes. Allow to cool completely now. Then top with Cool Whip topping and spread over the top, leaving the sides exposed. Top with graham cracker crumbs, chocolate bar pieces and mini marshmallows. Store in the fridge until you are ready to serve it. 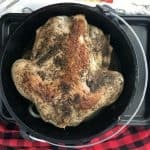 You can print off the recipe below and be sure to also pin this to Pinterest and share it on Facebook for easy finding later! 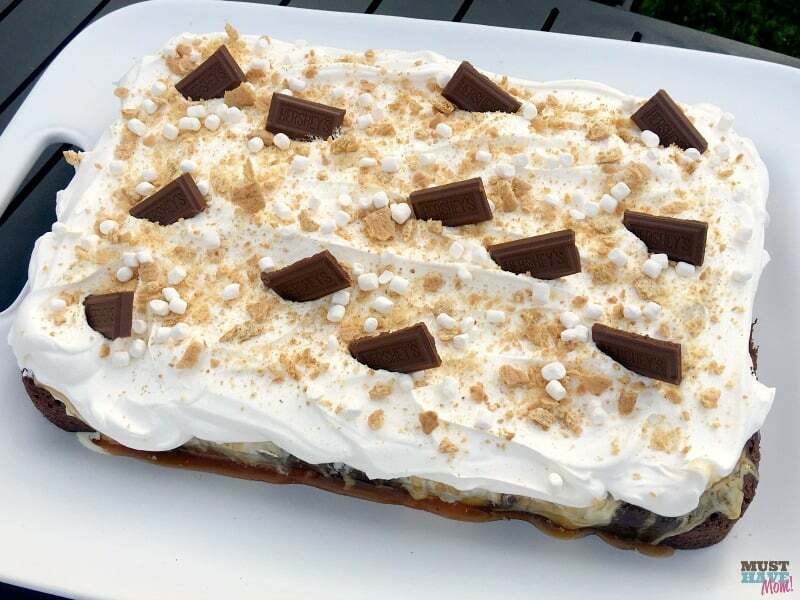 Quick and easy S'mores cake recipe perfect for outdoor camping parties! Bake cake according to directions on the package. Allow to cool for 10 minutes. Flip the cake over onto a serving platter. 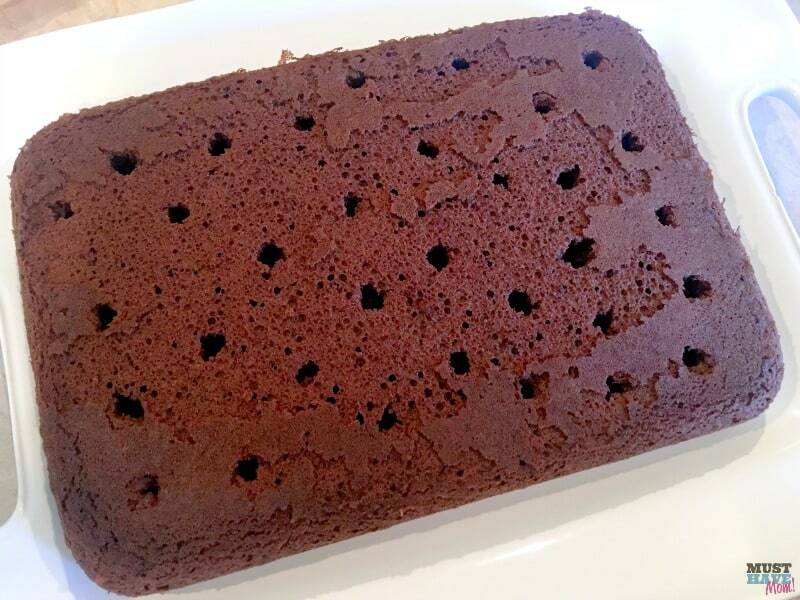 Using the opposite end of a wooden spoon handle, poke holes into the cake all over the top. 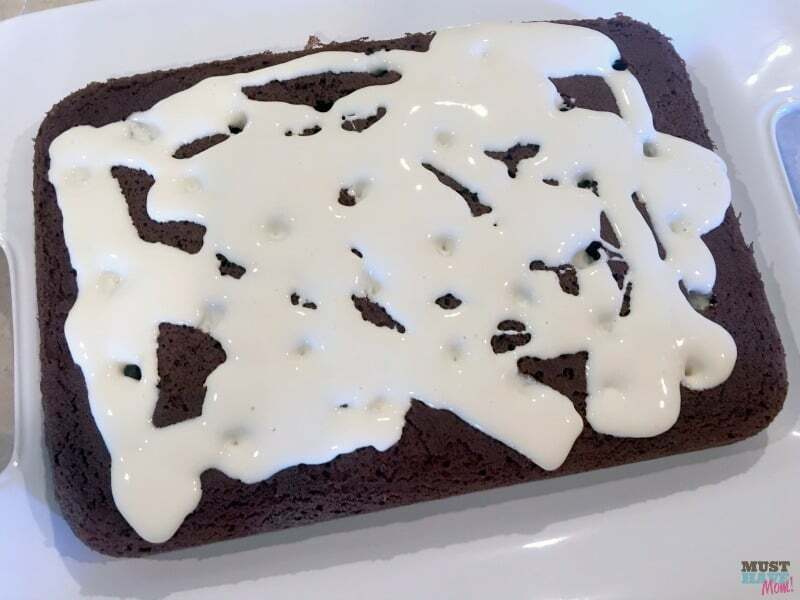 Pour one jar of marshmallow topping over the cake while the cake is still warm, but not hot. Next pour the jar of caramel over the top. Allow to cool completely and then top with Cool Whip over the top of the cake, leaving the sides exposed. 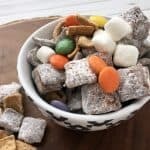 Top with crushed graham crackers, chocolate bars and mini marshmallows. « Family Game Night With the NEW Pie Face Showdown Game! 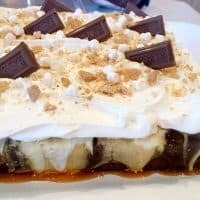 I really like your Smores Cake Recipe! 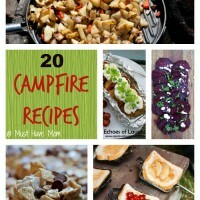 It looks so delicious and fun to make. 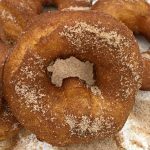 I will have to make this over the Holidays and serve to my guest. This cake looks so delicious. My Mom always made Jell-O poke cakes growing up and I loved them. I definitely want to give this one a try. 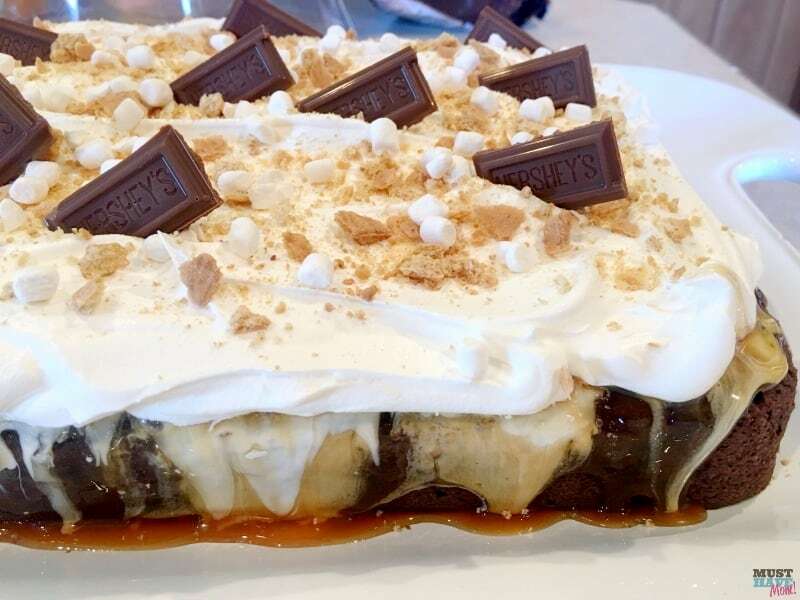 I love Smores and this cake looks heavenly and sounds delicious. Thank you for sharing, definitely going to share with my friends. this looks so yummy. And enough carbs for two days worth, haha! I love marshmallow frostings/fillings on things.